PTP Employer of the Year 2016! 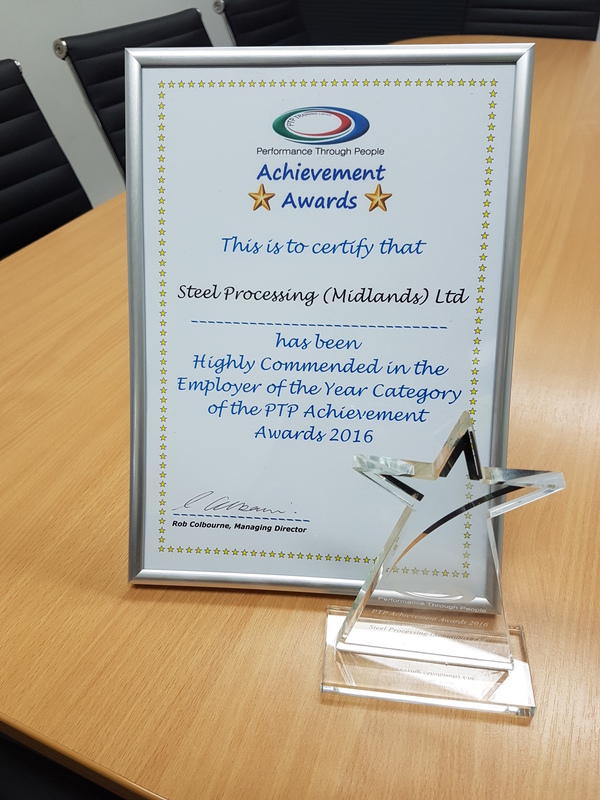 | Steel Processing (Midlands) Ltd.
PTP Employer of the Year 2016! Steel Processing (Midlands) Ltd are proud to announce that we have been awarded ‘Employer of the Year 2016′ by Performance Through People. The ceremony was held on Thursday 26th January for the annual ‘Performance Through People Achievement Awards’ at The Village Hotel in Walsall, West Midlands. To acknowledge the different challenges faced by companies of different sizes there were two winners with Steel Processing (Midlands) Ltd representing small and medium employers. Recent growth in both sales and building facilities has allowed SPM to employ staff, including apprentices, in a variety of working roles throughout the company allowing a wealth of new career opportunities. It is with great pleasure that we have been awarded ‘Employer of the Year 2016′ by PTP.